Seabourn specializes in culinary memories. This luxury cruise line has long been famous for its tradition of 'Shopping with the Chef'. In Quebec City on a Seabourn fall colors cruise from Montreal through Canada and New England, we took Shopping with the Chef one step further – to its natural conclusion, in a delectable Seabourn dish. Shopping with the Seabourn Quest's Executive Chef Jes Paskins at the Old Port Market just steps away from the ship, we returned laden with the bounty of Quebec's harvest season. 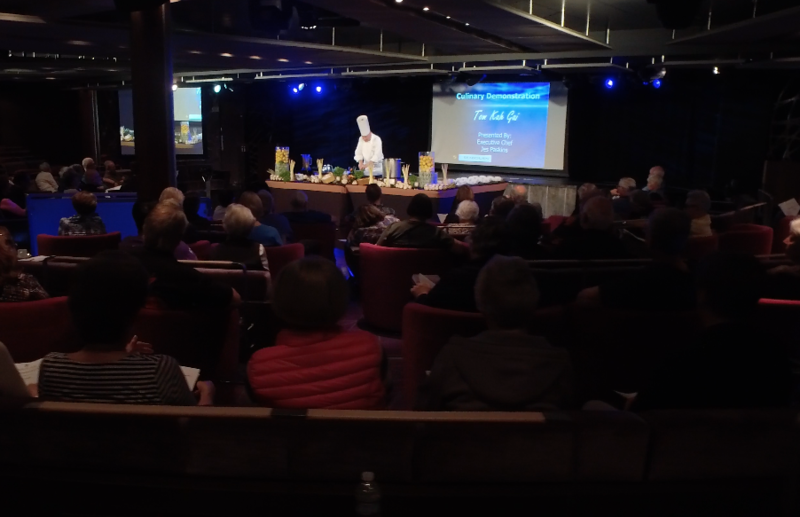 Seabourn's beloved culinary demonstrations usually take place in the Grand Salon. 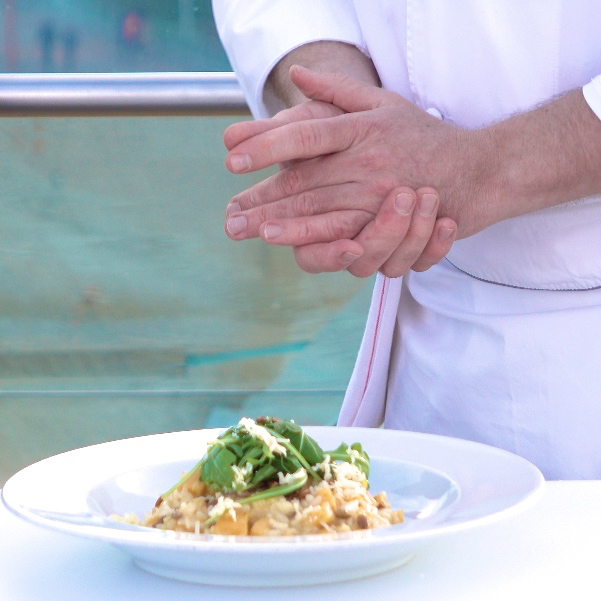 With the Seabourn Quest docked at the foot of Quebec City's picturesque hill and in the shadow of the famous Chateau Frontenac, Chef Jes decided to celebrate his interpretation of Quebec's local flavors on deck in full view of the Quebec skyline. Chef Jes' Roasted Quebec Pumpkin Risotto is as delicious as it looks, and he was kind enough to share the recipe for our fall harvest feasts at home. Heat a pan with Olive oil and butter; once hot, sprinkle in your Pumpkin Seeds. Gently pan-fry them, keeping them moving so not to burn until they start to pop. Lightly season and then put into a strainer to remove most of the oil and butter and put the rest of the seeds onto absorbent paper to remove the rest of the oil and butter allow to cool and use for garnish. Peel the Pumpkin, de-seed and cut the pumpkin into nice diced pieces. Coat with Olive oil, Cracked Black Pepper, and roast in the oven for 25 minutes at a high heat until golden brown. Allow to cool, and set aside. Drizzle a little Olive Oil in a pan. Sautee Shallots with butter, then add the Arborio rice, and slowly add the White Wine until it absorbs. Then add pre-warmed Chicken Stock little by little, waiting for it to be absorbed by the rice each time before adding more. As the rice is almost cooked and still a bit firm, al dente (not fully cooked) when you test it, stir in the roasted Pumpkin, Parmesan Cheese and diced Cold Butter. Mix until the cheese and butter are fully melted and incorporated, then test and season to taste. Place a serving into the center of a bowl, sprinkle fresh-shaved Parmesan Cheese and Roasted Pumpkin Seeds over the top. Add a little Rocket Lettuce on top of the Risotto, drizzle some Olive or Pumpkin Seed Oil on top to finish, and serve immediately. Bon Appetit! Pair Chef Jes' Roasted Pumpkin Risotto recipe with some sparkling – or if you can get it, Quebec iced cider – and you'll experience Seabourn's interpretation of the taste of Quebec at home. Of course, we recommend trying Seabourn's renowned cuisine in person on one of Seabourn's Canada & New England Fall Colors cruises – or on any Seabourn cruise anywhere in the world. Your taste-buds will thank you!